Gen'l George Meade|Gettysburg Victor|"Forget Not His Deeds"
George Gordon Meade entered the U.S. Military Academy in 1831 and graduated 19th in a class of 56 members. He resigned in 1836 to pursue a career in civil engineering. In 1842 he rejoined the army and served in the Corps of Topographical Engineers in the construction of lighthouses and break­waters and in geodetic survey work. After the beginning of the Civil War in 1861 Meade, then a Captain, was made Brigadier General. In June 1863 George Gordon Meade was given command of the Army of the Potomac. The General Meade Society is an active organization that meets regularly to discuss General Meade’s role in the Civil War, as well as other related topics, and contributes to Civil War preservation. The Society’s board meetings are held on the second Thursday of every month at 7:00 p.m. All are welcome! Membership in the Meade Society is open to all who are devoted to history and value patriotism. 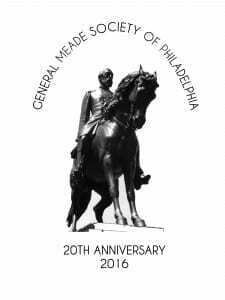 Visit the Membership page for information about joining the General Meade Society.